Apparently, in the 1950's, people did not have as many clothes as we do now. When we moved into our little house, which was built in 1950, we gave up our walk-in closet. Now, my husband and I share this little closet. 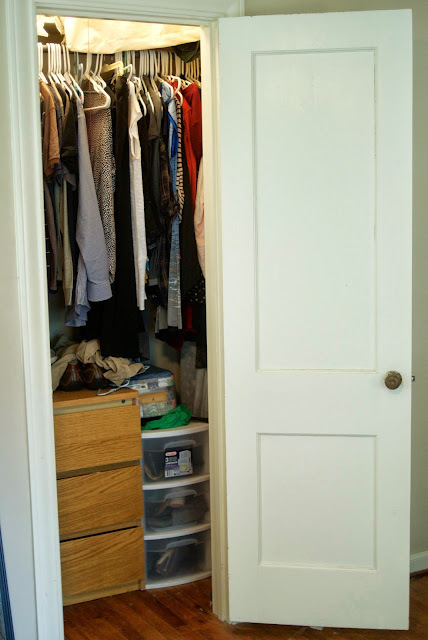 Sharing this little closet has been super helpful for me. Since I can't fit too many clothes in it, it stops me from buying too much. Or when I do buy something new, something has to go. However, sometimes I scan the items in my closet and I'm bored with them. I feel like many things I own have been worn so many times and are now getting frumpy. Or I feel like I don't have a lot of key pieces that I wish I owned. Transitioning into motherhood has also made me rethink my closet space. A big part of me is eager to start fresh--not with more--but with wiser choices. I think for a long time I've battled with myself about clothes. I know what I like, but instead of being stuck there, I want to feel freedom there. I know that I'm not a fashionista and I don't want to be. I like to layer--so what if I look a little like a teacher. I am one! I don't like tight shirts--that's okay. I like to cute and cozy--not edgy and blingy. And that's okay. So, lately, I've been working on letting go what I think my closet should look like. I want to let go of feeling dissatisfied with my closet because I don't have as many cute things as so-and-so or extra money to buy all those cute items. I want to let go of thinking that more/better clothes will make me more satisfied with what I look like. Instead, I want to really examine what I like and buy a few key pieces that will last. I want to hold onto who I am and feel confident in what I wear. I don't want to live in wishville and instead be grateful for all the clothes that I do have. Because even though we have a small closet, it's filled with what I need. In fact, I'm pretty sure that it's filled with much more than what I need. Love this post. There are times I'd like to throw everything in my closet out and start over with seven basic pieces. No matter how many items I haul to Goodwill, my closet seems to stay full.